Phatmusic manages, promotes & publishes Phatfish. and writing songs for the glory of God. 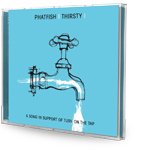 'Thirsty' by PHATFISH is a single released to raise awareness and finance for the safe water initiative 'Turn On The Tap' which is run by Samaritans Purse.